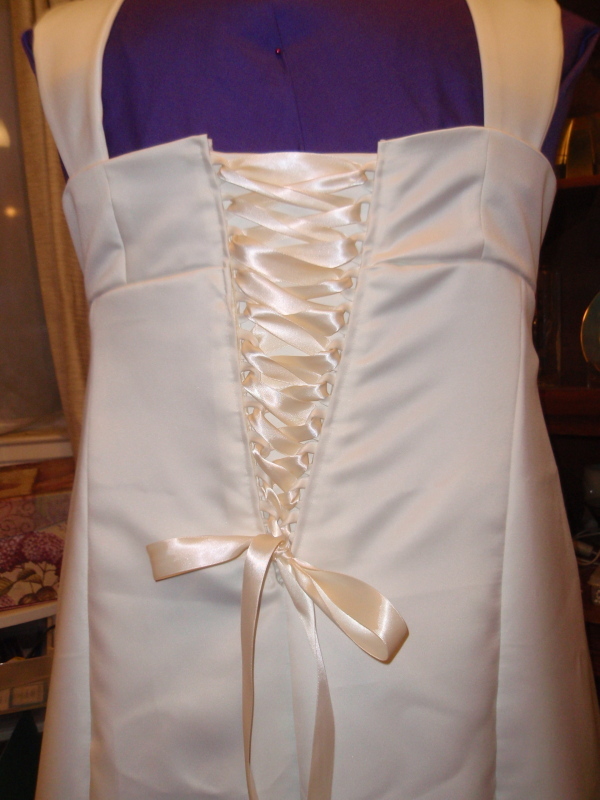 The original pattern for the underdress of my wedding gown had a zipper, but after I put one in, I found that I didn’t like it at all, so I decided to put in a corset back. I had never made a corset back before, so it took a little online reading to figure out how to do it. First, I needed to make spaghetti straps for the loops. I tried for a few hours to make them and turn them and even with a turner and advice from my future mother-in-law, I still couldn’t do it…. I thought about making them wider, but the strips were a lot wider than I wanted. So…. I decided just sew my straps on the outside, which doesn’t look as good or pliant as the traditional method, but didn’t look that bad in my opinion, and was MUCH less hassle. If you don’t want to go this route, you could use cording or ribbon. 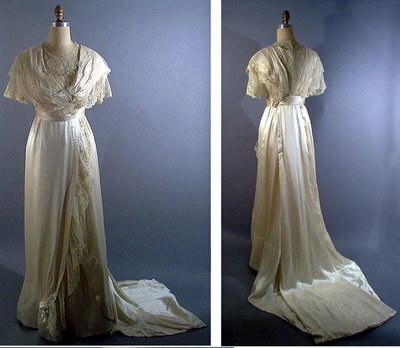 I wanted my loops to match my dress perfectly, so I made them out of the peau de soie satin of my dress material. 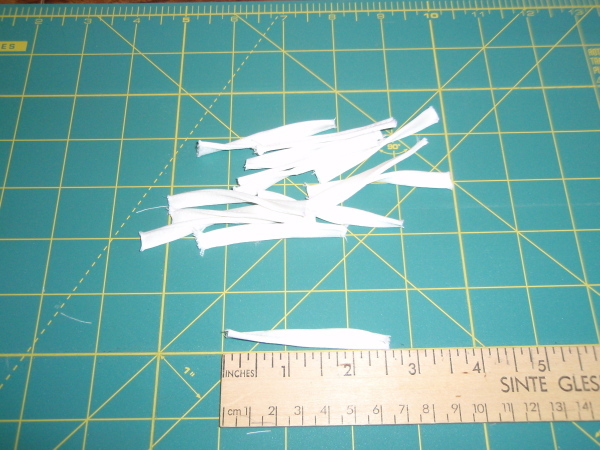 I cut my loop strips 1 1/4″ wide, then cut lengths of 2 1/2″. 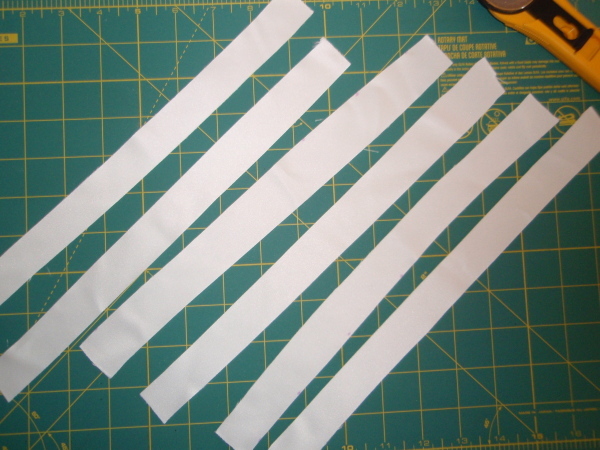 I measured the back of my dress (13″) and made a paper pattern so that my loops were even. 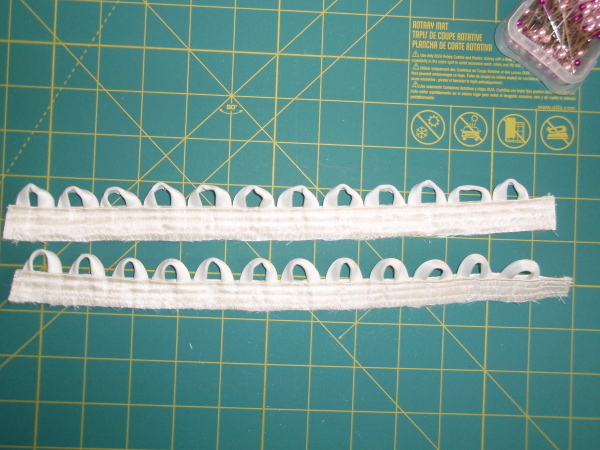 I looked at a corset that I own to figure out about how far the loops needed to be and decided on an inch. I first tried pinning the loops to my pattern, but was having trouble and decided to tape them, later taking the paper and tape off after I sewed them into position. 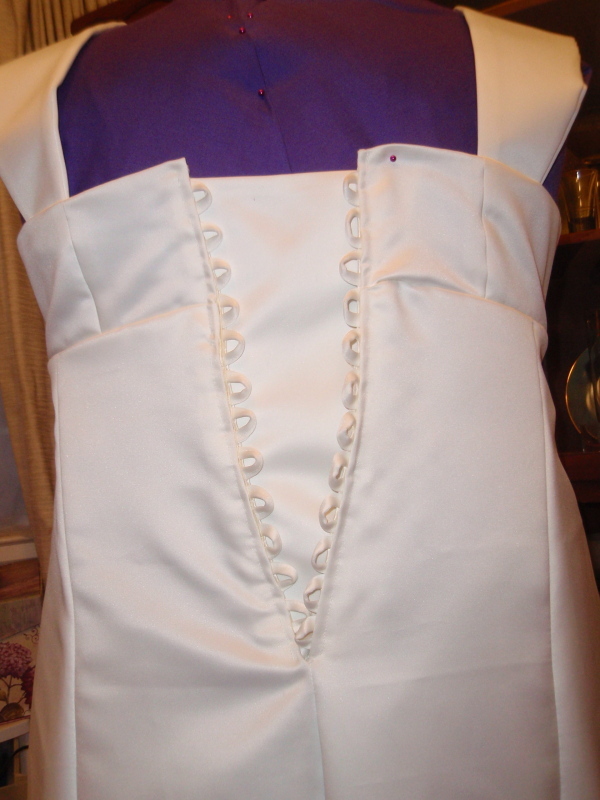 Then I cut 13″ strips of the satin taffeta for my overdress and sewed the loops on the doubled fabric. I used two strips for each side. 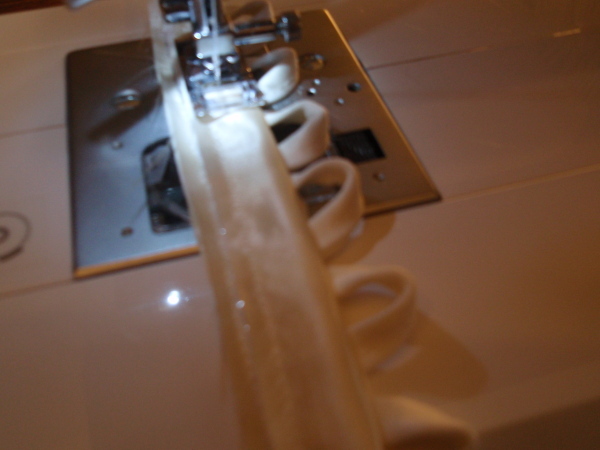 You could use binding or ribbon or fabric with interfacing if you wish. I wanted the strips for my back lacing strong and durable, so I reinforced it with two doubled fabric strips. 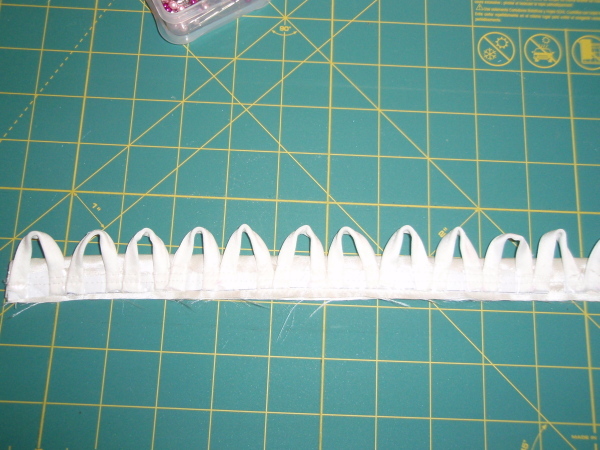 I trimmed the fabric strips and finished the edges after triple reinforcing each loop strip. I pinned one loop strip to the right side of my dress, pinning it between the lining and the dress, folding down the seam so that the edges didn’t show. If you don’t want to go in between the lining or don’t have lining. 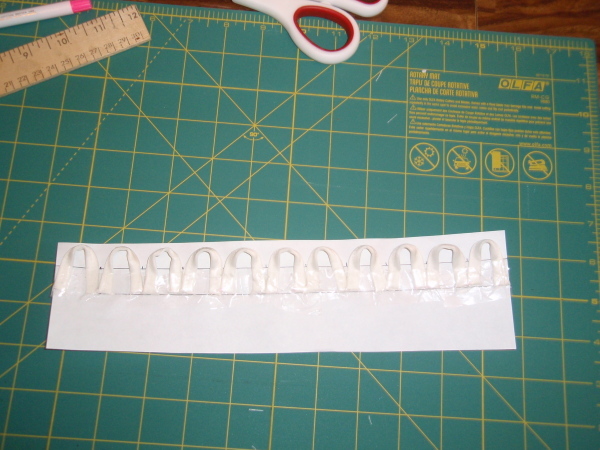 you could always put ribbon or a piece of fabric on the inside to cover the edges of the loop strip. For the other side, I inserted a modesty panel. That’s optional, depending upon what your preference is. 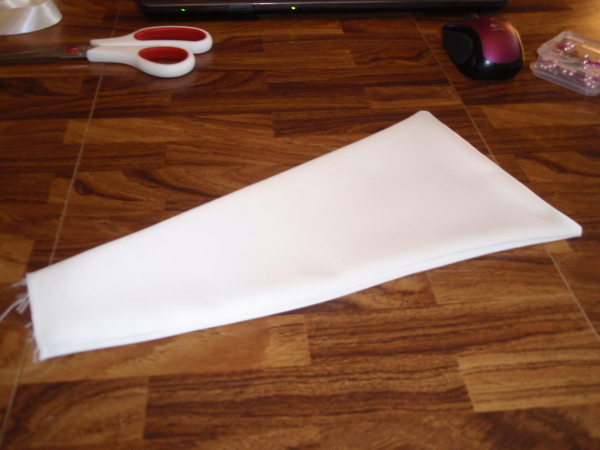 I made a paper pattern for the modesty panel, and then cut it out of the satin. I pinned the modesty panel in with my loop strip between the lining and the dress, just like I did on the other side, and sewed it. If you wanted to make one removable, you could sew in snaps or velcro or ties or something, of course all depending on what your preference is. I still need to do some hand sewing modifications and finishing as well as some reinforcing stitches. 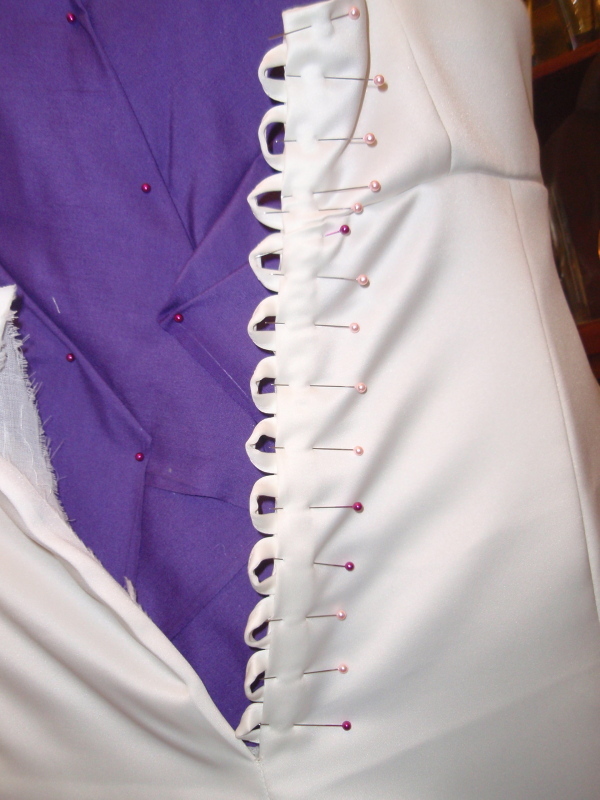 My corset loops are pretty strong, but if you’re making your corset back to “hold” you in, you might want to put in some boning in the bodice for reinforcements. When you say: “So…. I decided just sew my straps on the outside, which doesn’t look as good or pliant as the traditional method, but didn’t look that bad in my opinion, and was MUCH less hassle. ” What do you mean by “sew my straps on the outside”? Do you mean rather than line the loops up in between the dress layers individually and then sewing? Thanks, nice pics. I went back and read again, it does not say how you made the loops, or did I really miss it? It means that I sewed the outside of the loops rather than turning them. I had a hard time turning such narrow strips of fabric with the heavy satin and instead made the seam visible instead of hiding the thread on the inside. Beautiful job and really smart! Well done.